Thanks to my friend Kyle Robino, I am starting a new tradition. She suggested that I feature a tablescape each month on my blog. Perhaps it's her thorough understanding of my hoarding problem when it comes to glassware, dinnerware, monogrammed linens etc. 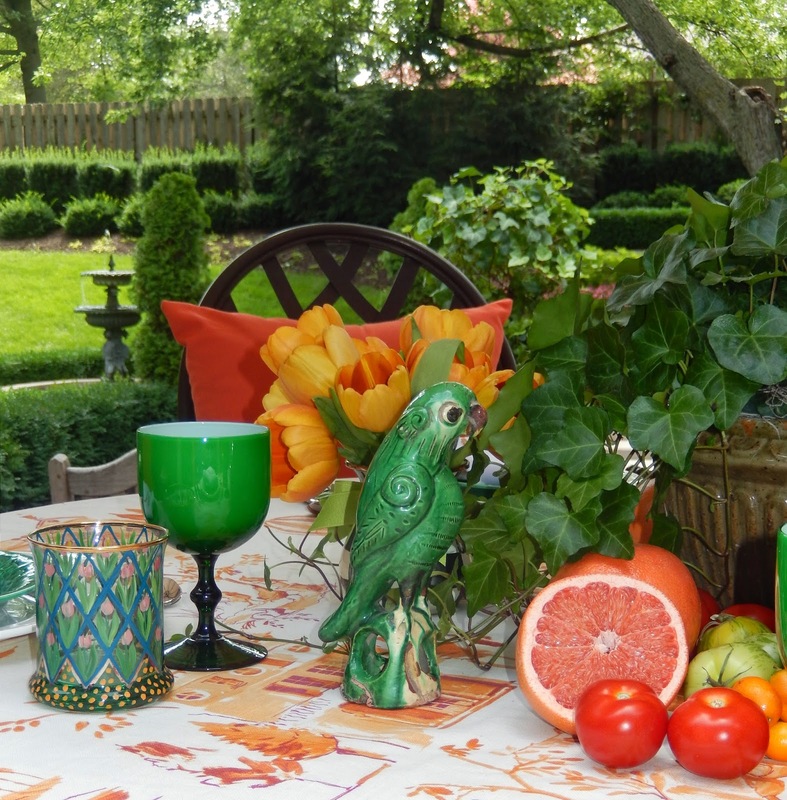 So here is the first installment of the monthly tft tablescape: June. 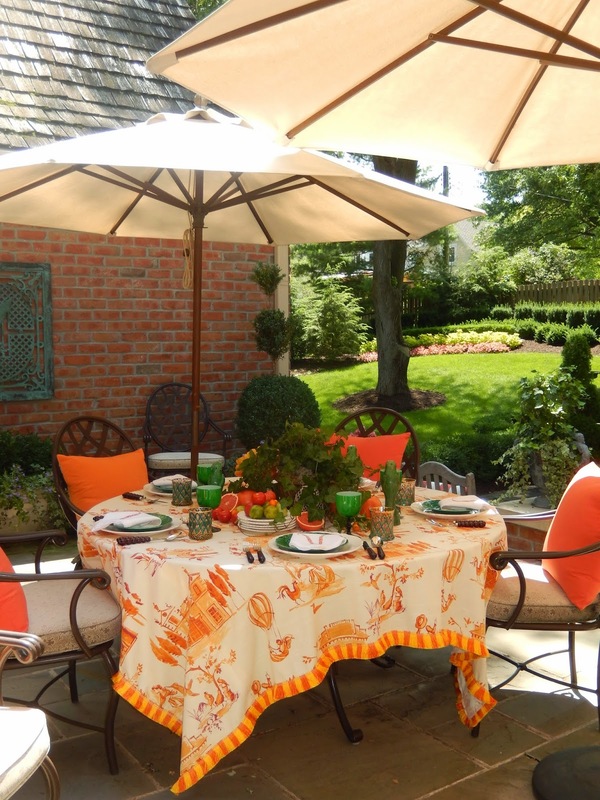 I realize it's July, but I was so excited to use the orange toile table topper, I couldn't wait until next month, and of course I'll have to do a red, white and blue tablescape for July... So you are getting June and July this month. Remember these napkins I ordered from a Walker Valentine trunk show? You can visit Walker Valentine anytime ~ just click on the link in my sidebar. I adore this monogram… totally copied from Danielle Rollins! Another trunk show coming up soon... See info below! I set the table in the morning and took pics all day long. I love this photo... Too bad my landscaping along the fence desperately need trimming! So embarrassing! I had fun with this little shindig.. sorry for too many photos, but how to choose which ones to pitch! I tried the most delicious recipe which I will share coming up. PS It's my birthday. I'm forty eight. Here is the info on the upcoming Walker Valentine Trunk Show ~ right here in Omaha! What a treat to have a San Francisco specialty shop come to us! See you there! Happy birthday Jan! 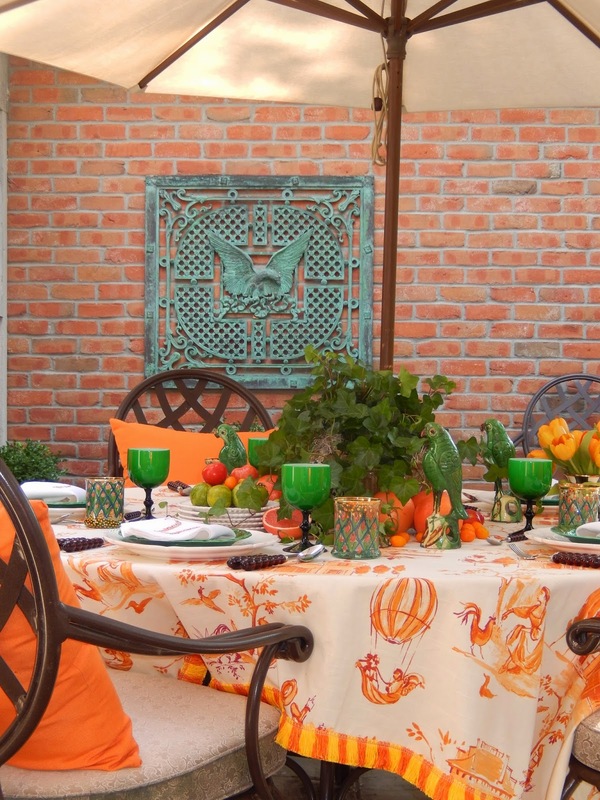 I love your table and your toile tablecloth. Orange is my favorite color. Happy Birthday! Thanks for such a wonderful blog. I check it every morning! One of the prettiest tables I have ever seen!! Love all the punch of color! 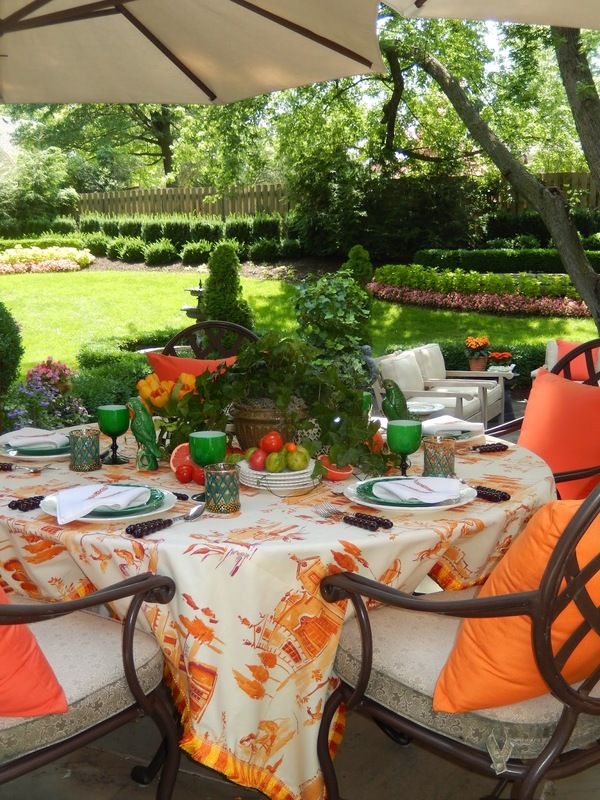 Your table is beautiful and your garden is also - there is always something that needs to be done in a garden! 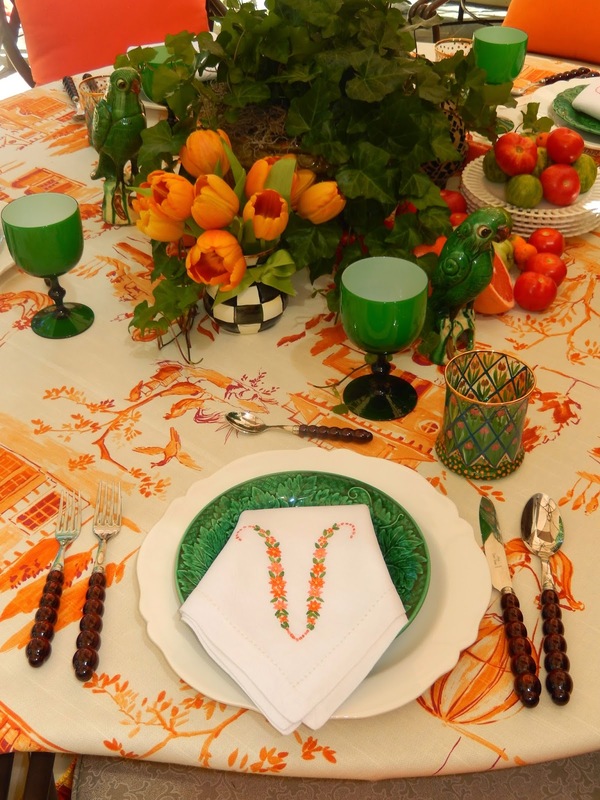 Love your colored glassware - I hope you had a dinner party out there that evening! 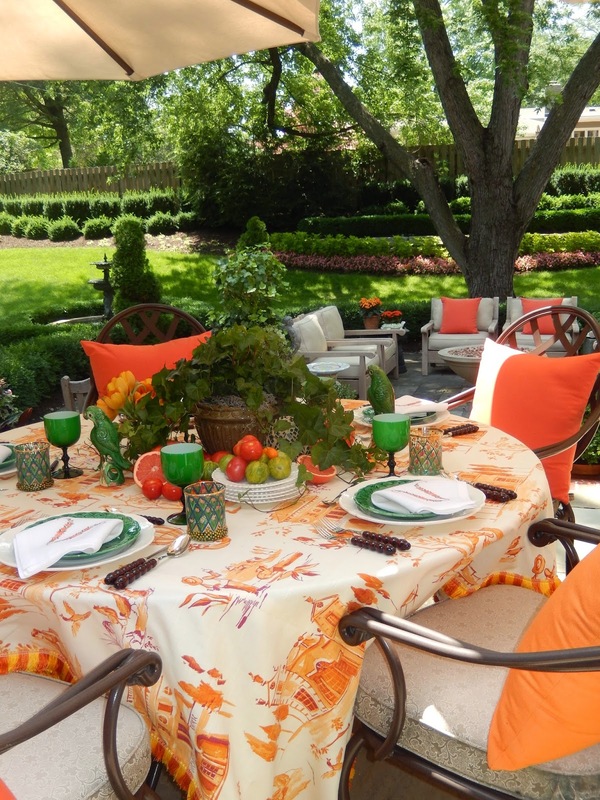 Wonderful tablescape...great colors...great topper...love the flatware and colored glasses. Very Pretty. Happy Birthday! Happy birthday, kindred spirit. I love your tablescape. The toile is such a pretty underpinning to the entire arrangement. 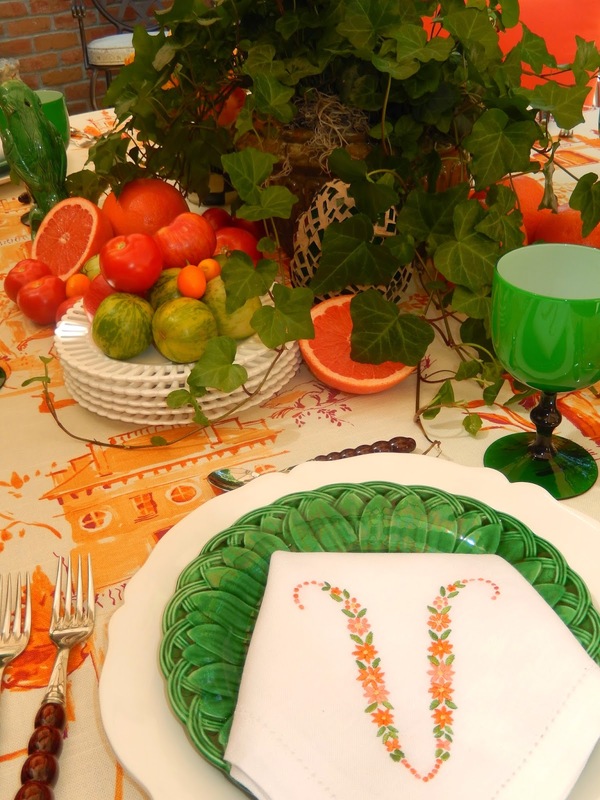 Your eye for the details is impeccable--the green parrots, the goblets (source, please), the cutlery…and the vegetables and fruit amassed at the base of your centerpiece--gorgeous! Thanks for sharing your talent with us. I love the idea of a monthly table-feature! First, Happy Birthday! I would love to be 48 again. 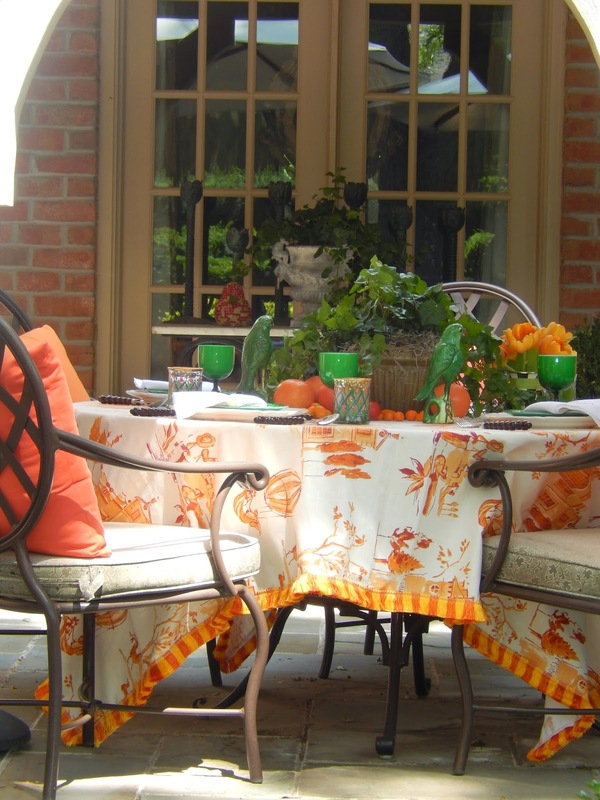 Love the tablecloth. Can you list on your post the brands--patterns etc. 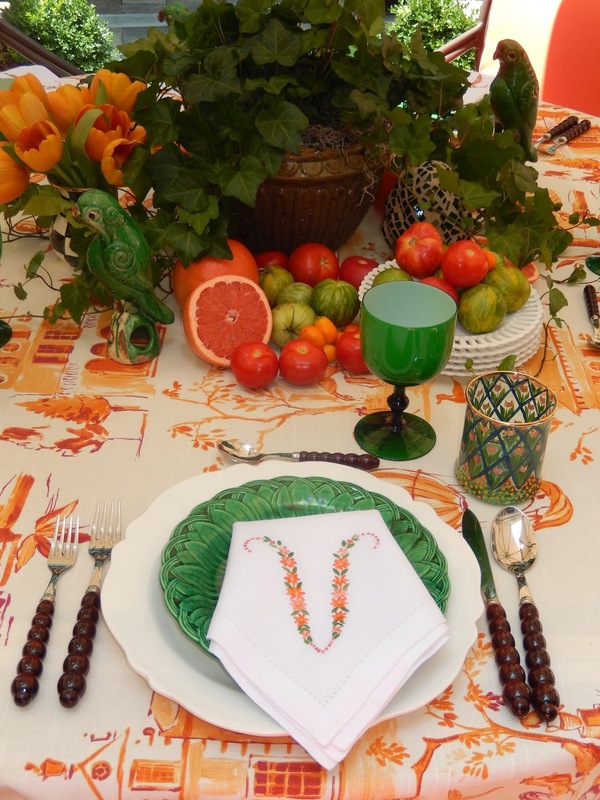 of the items you use like we do on other tablescape blogs such as Tablescape Thursday? I would love to get the toile fabric but have no idea who makes it. Everything looks stunning. You have taken a color - orange - to all new heights. Love the green goblets, too. Tablescaping is one of my favorite things to do so I look forward to seeing your presentations. Gorgeous table setting and Happy Birthday to you. This is so remarkable, and basically breathtaking!! 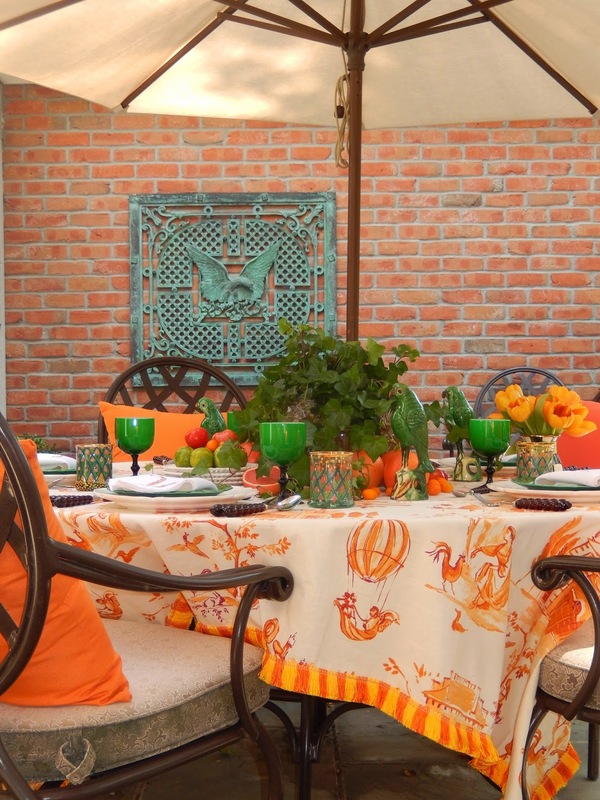 You have inspired me to love orange and many color combinations that I would never have considered! Happy birthday to a daughter that any mother could only dream of having! Wow!! Just stunning Jan. I love this idea for a new series as I consider you a master. The napkins are amazing I think I need to treat myself not that I am need of more napkins but these are just too pretty!! I love the color, looks so rich against the beautiful green landscape..you nailed it! Can't wait for July's! Happy Birthday! Have a great time celebrating! You have such a wonderful eye for color. You pick just the perfect shades consistently and they are so original and soothing. 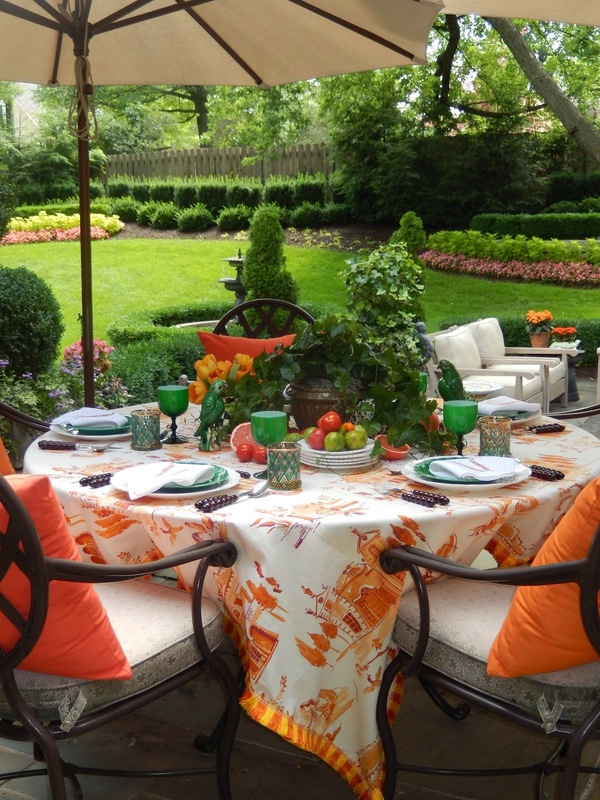 I look forward to more tablescapes! 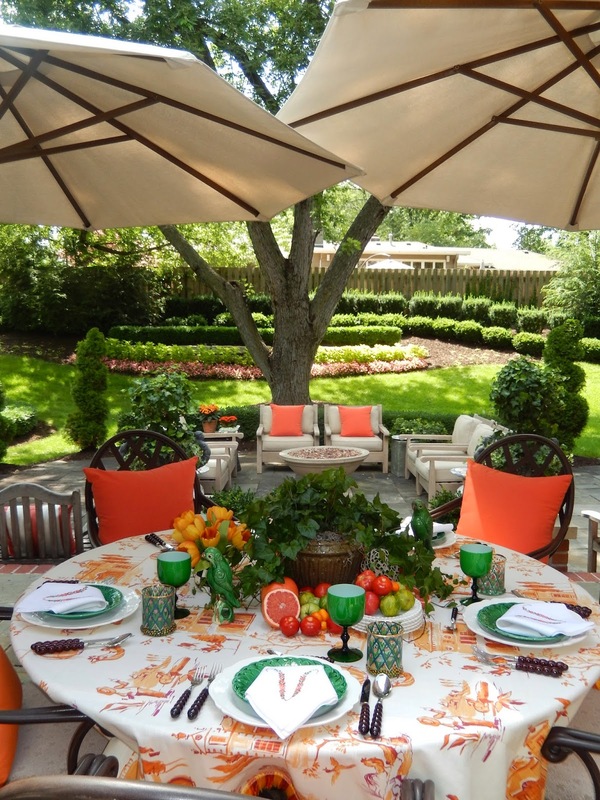 Dear Jan, Where did you find the orange toile tablecloth? It's beautiful, and a very happy birthday! Thank you to all for your sweet comments and birthday wishes! The smaller glasses are Mackenzie-Childs and discontinued.. have had them forever. The flatware is from Material Possessions in Chicago from years ago.. The white plates are from France :) And the green majolica plates hang on my wall in my house.. I just put them out for the photos! Happy birthday, Jan! I still read your blog tho I don't comment much. You really inspire me! Found the fabric! It's a Ronnie Gold.. Happy Birthday! Love the idea of a monthly tabletop from you. Can't wait. I'll be pinning, pinning, pinning. Your set a fantastic table! Love the toile tabletopper. Absolutely fabulous! STUNNING! Have an amazing fun filled birthday! GORGEOUS table! Swoon! And your yard is equally show stopping! The color scheme you used is stunning! Happy Birthday and thank you for sharing this inspiring table design!